Today, I took delivery of a pile of business cards for the blogsite. 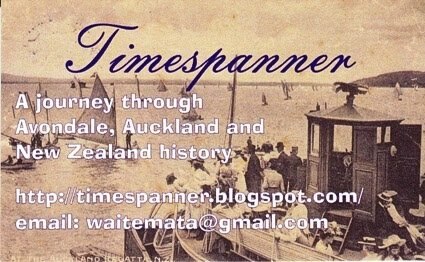 Readers may think it a bit odd, a barmy history nut like me ordering up business cards for Timespanner. A bit of a brag, perhaps. Well, possibly -- but the main reason is the trouble I've had for nearly two years now explaining to folks just how to access the blog. And because of Timespanner's main raisons d'être -- historical research and stories, photos of control boxes, art and murals along the way -- the need to be able to communicate to folks that Timespanner is one word and what the site URL is gets more and more frequent. It has helped that Blogger is linked to Google, so putting Timespanner in Google will usually point you here, without much trouble, but -- folks keep think Timespanner is two words. Even when I say it isn't. So -- the card. Which I think looks great, and was prepared by Words Incorporated at Blockhouse Bay, who also prepare periodicals I'm involved with such as the Avondale Historical Journal, NZ Legacy, Point Chevalier Times, and publications such as Point Chevalier Memories, Wairaka's Waters, The Zoo War, A Doctor in the Whau, They Trained Beside the River, and the St Ninian's of Avondale 150th anniversary booklet. Brom there does great business cards. An update: Just realised today the image is that of the Eagle (lower right), one of the Waitemata paddle steamers. It comes from my postcard collection. They sound cool, Sandy. No, I'm not on Facebook anymore (my inner Luddite looks warily at such things, y'see). If you can send a pic, y'know where to find me! Cheers, Jayne. Now, to find out what folks' reaction will be out in the non-'Net world. What a great idea. And you can give it to police when they start questioning you about your suspicious camera lurking behaviour. True! "Er, yes, officer, I'm with the media, here's my card ..."
Cheers, Marita. They're certainly helping -- "Have you heard of my blog? No? Well, here's its card ..."